Salesforce provides an upsert method for its business objects. Upsert is a combination of the words Update and Insert. With this method, existing records are updated and new records are inserted. Use of this method avoids creating unwanted duplicate records. To use the upsert method, the object must have a custom field identified as an External ID. 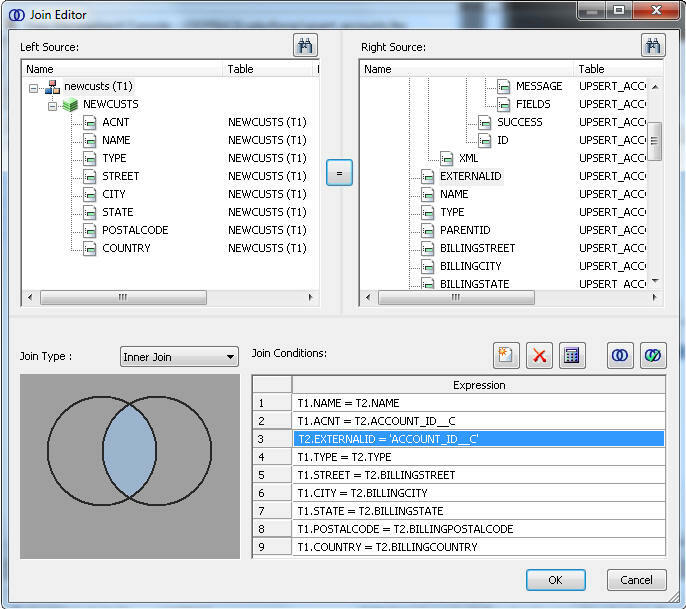 Under Customize, select an object, such as Accounts. Click Fields. Click New and select a field type, such as text. Fill in the field label, for example, Account ID. Fill in the rest of the required information and select the External ID - Set this field as the unique record identifier from an external system check box. Click Next, Next, and then Save. The Account (or other object name) Fields page opens and shows the new field with its API Name, Account_ID__c, as shown in the following image. Create the synonym for the upsert method, as described in Creating Metadata for Salesforce. The new field you create appears as the last field in the INPUT segment.